At Podere Girasole you will enjoy marvellous views and top comfort. The Villa is divided in 5 Tuscan style houses that can accomodate up to 20 persons together. 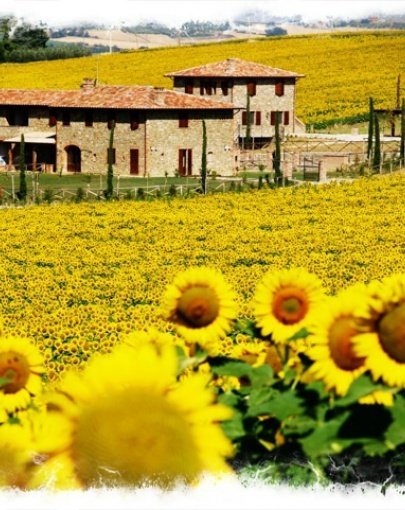 Podere Girasole is a restored tobacco house from the 19th Century. In the middle of Italy, in the border of Tuscany/Umbria, surrounded by an unexpected feel of serenity, at Podere Girasole you can admire the brightness of the restored villa with real astonished eyes, taking you back to a times past. As a Country villa divided in 5 guest houses, it works best as a place where friends and family come to relax, share meals, explore the countryside and drink wine late into the night. Soak up the Southern Tuscan sun by th 15 mt infinity eco-salty swimming pool, enjoy a lush garden with over 250 lavender bushes, roses, cypress trees or marvel at the sight of the million sunflowers surrounding the property in the summer, poppies in the spring and golden wheat in late summer, offering a stunning variety of colors and textures throughout the year. The tiny local village of Paciano is only 2 kms from Podere Girasole hosts 3 restaurants, 2 groceries, 2 bars, an ATM Bank machine, Pharmacy, Post Office and an English Studio with a selection of books and novels regarding Italy. As guests at the property you will have special treatment and a discount of 10% at the restaurants. In the neighborhoods of Paciano there is a wide variety of activities one can do, you can choose among art, culture, nature, sports. 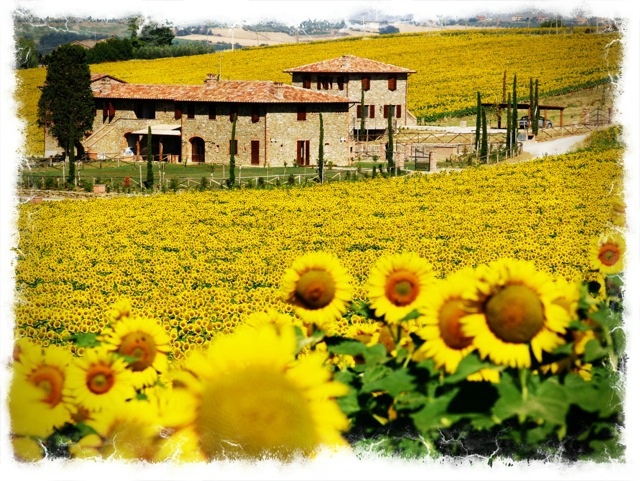 From the farm resort you can visit Florence, Montalcino, Siena, Montepulciano, Cortona, Perugia, Orvieto, Assisi, the lake Trasimeno, Rome and much more! Girasole is located 10 minutes by car from the Chiusi Chianciano Train Station, only 1 hour with the Euro Star Train from Rome. The villas are all equipped with air conditionig, free wifi, cable tv, Ipod speaker, and all the best comfort to feel home away from home!